The face of the Catholic Church is often a masculine one, whether it be the pope, bishops, or local priests, and in recent decades this has been viewed by many as a bad thing. The widespread and wholesale effort to feminize the Church, through music, liturgical flourish, and more females on the altar has failed to produce the ecclesial popularity (particularly among men) promised by its promoters. Perhaps a better model than pastel streamers, saccharine hymns, and squishy homilies is closer at hand than Catholics might think: the Church as Mother. For the two years I lived in Rome I, like most ex-pats, spent large swaths of time just watching the culture around me. I was able to see that there is something special about Italian mothers and grandmothers. These Mediterranean mammas are determined, passionate, attentive, devoted, and tough-as-nails. In their unique character many of the eternal truths of what our Mother the Church wishes to give us are illuminated. The Church, following the rhythms of the liturgical year, follows the unfolding drama of God becoming man and dying on the cross. Vacillating between feasting and fasting, highs and lows, these passions are evident in processions, devotions, but particularly in Christ’s Passion and death, offered daily in the Mass. Through all of these, the Church reminds us that Christ did these for us. That he loves us, is present to us, and wants to give us life in abundance, and not simply pleasant platitudes. I once attended a Mass with Pope Benedict with my six-month-old niece Emma in my arms. After the Pope planted a big kiss on her forehead during the procession at the end of Mass, Emma and I made our way out into St. Peter’s Square. Being the feast of All Saints (November 1st) it wasn’t exactly warm outside and Emma’s legs weren’t covered. Before making it to the obelisk, not one but two determined nonnas berate me for not covering up the baby’s legs. As locals can tell you, it is also not advisable to venture outside if your hair is wet or the back of your neck uncovered. With a wagging finger, mammas will let you know that you will catch a cold that could be the death of you. 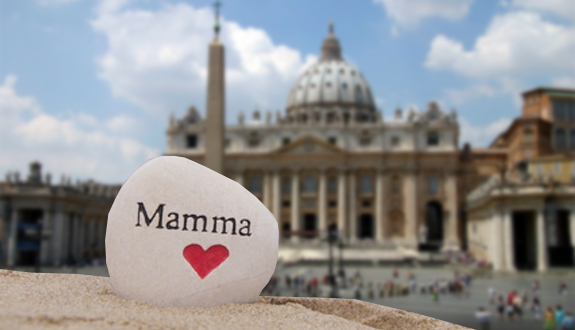 Our own Mother, the Church, knows that it is vital to tell her children the truth about life for their own salvation. As fashions have come and gone, she remains steadfastly guarding the core truths established by Christ two millennia ago. So while “go to confession” may sound as outmoded as “don’t sit under the air conditioner with your neck uncovered,” the impulse is the same – maternal love. Everyone knows an Italian mother makes sure her family eats—and eats well. If you’ve eaten your way through Italy, you know that even the most simple dish of pasta is like heaven on a fork. What could be more sublime than bread from heaven? Everyday, around the world, the Church offers us the Eucharist—the body and blood, soul and divinity of Christ. Heaven without the fork. When an Italian mamma has lost her passion and focus for the well-being of her children, she is like the salt that has lost its flavor. A real mamma is not content with “Meh, do what you want.” Rather, she knows intuitively that it is good to have clean house, a full tummy, and soul filled with peace and joy. Peace, joy, order, beauty and love are the bedrocks of soul-craft. I recently met an Italian mamma who moved to the U.S. over 20 years ago after falling in love with an American solider. Traveling the world with her husband, she said, “No matter where we lived, I was able to provide a beautiful home for my children, even in the most humble of places.” Using her gifts, she made sure all the essentials were there for her children to grow. And with her melodic voice, she then put my infant son to sleep simply by listing off the names of paint colors featured in her interior design shop. Ah, peace. The Church, too, does not neglect these deep and often overlooked essentials. Order and beauty are entrenched in Catholic architecture, art, music and liturgy. Peace and joy are provided through prayer, worship, and praise of the God who created us. And while some of her requirements may seem strict, they are only given with great love. Yes, it is true, some sons never leave mamma’s house, as odd as this seems from the American point of view. High unemployment and a limping economy have done little to help sons leave the nest. And really, who can beat mamma’s cooking? Like Roman sons, priests also never have to leave their home. And while odd in the natural order, in the spiritual order of things having a priest at the heart of the spiritual home makes perfect sense. No matter how terribly behaved her children are, Italian mammas always welcome them back home. She can only stay mad at them for so long. She might hit you with an umbrella first, or yell at you while gesticulating madly, but sooner or later, somewhere in the drama, she will let you know one way or another that you are loved and forgiven—probably by feeding you. Like earthly mothers, the Church offers great mercy to her prodigal children: first through confession and penance to mend what is broken and then through an invitation to join the family for a meal once again. Every mother, of course, has her flaws and weaknesses. The Church is uniquely holy—“unfailingly holy” (CCC 823), but as the Catechismbeautifully explains, “the Church, embracing in its bosom sinners, [is] at the same time holy and always in need of being purified” and so “always follows the way of penance and renewal” (par 827). The Church, as Mother, understands our weaknesses and knows that we are sinners. Sometimes we can feel like Peter when he responds to Our Lord question if he would leave him too: “Master, to whom shall we go? You have the words of eternal life.” (Jn 6:68). We can feel like that child who, when angry with his mother, threatens to run away from home until he considers or experiences the alternatives. Like mamma’s lap, Holy Mother Church is where truth, solace, guidance, peace and love are found, come what may.